I’ve worked with this recipe many times, and it never misses the mark. That mark includes simple, virtually foolproof preparation, ingredients likely to be on hand, ability to remain warm, singularity, and, of course, tastiness. 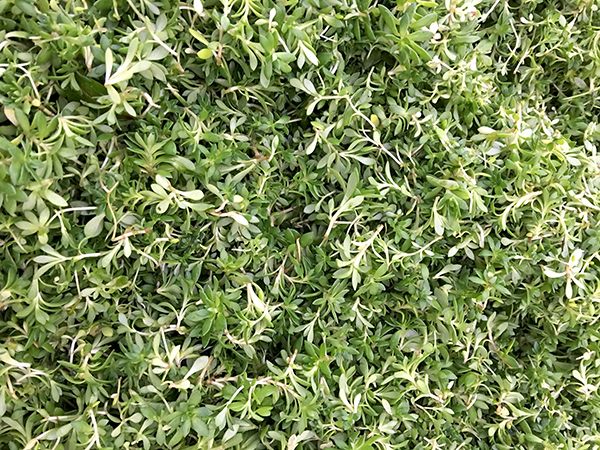 I think we’ve enjoyed it in warmer months, but it really comes into its own during the colder. In fact, when I texted Barry from the Greenmarket on Saturday, including a shot of the fishmonger’s menu, and asked him to pick from it, he came back almost immediately, “Monkfish, since it’s cold?”. He was describing another of its virtues: Forty or forty-five minutes in a warm oven means a cozy breakfast room with a window open a crack for fresh air. 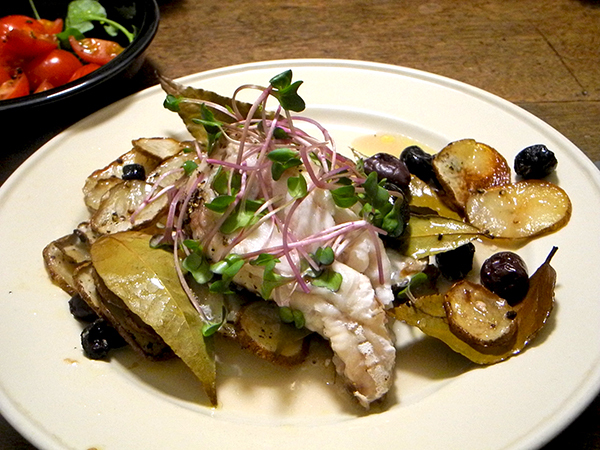 The recipe came to me years ago, via the New York Times, from Mark Bittman, who suggests it also works with “almost any firm fish fillet”. He mentions red snapper, sea bass, pollock, among others, but I would also include hake, haddock, and cod, remembering to be careful about removing the fillets from the pan when done. 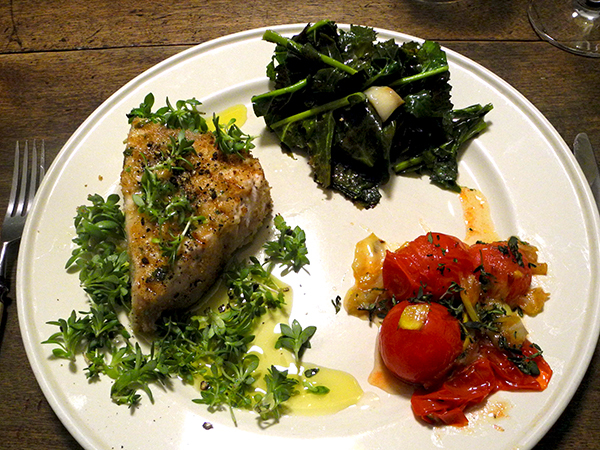 The old was the breaded swordfish, new was the stonecrop; old was the cherry tomatoes, new was the addition of leeks; old was the rapini, new was having it in February. 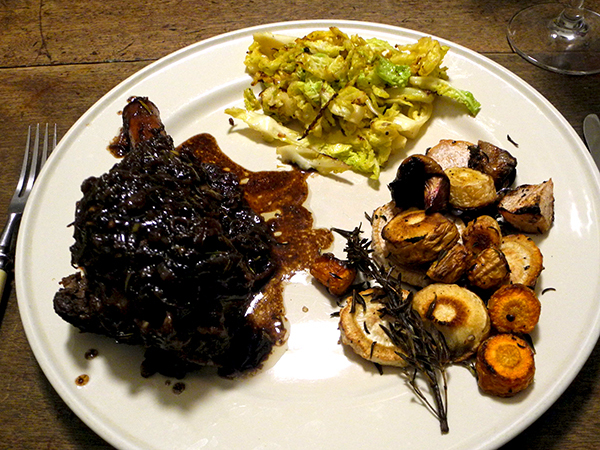 This meal was extremely winter-sympathetic, and the weather totally cooperated on this blustery, wet, late-February evening. I also think this was my most successful braised lamb shank yet, maybe because I had plenty of time, and because I used all of it. 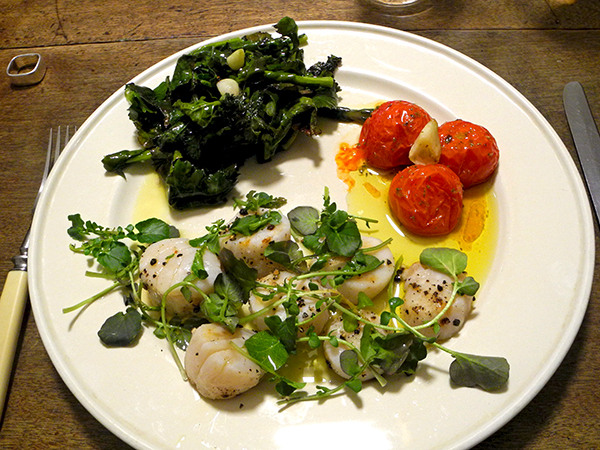 I’ve not been able to find decent-size scallops at the Greenmarket this winter. On Monday however P.E. & D. D. Seafood had some that appeared larger than any I had seen since last fall, so I scooped up a few for this dinner. Along with them we enjoyed the very last of the cultivated upland cress I had brought home from Alewife Farm a few days before; I was also very happy to have some local (well, at least local northeastern New England) tomatoes on the windowsill, and I was almost shocked to find that Lani’s Farm was back in the Greenmarket in full force on Monday, or at least in force sufficient to be able to offer what I have to believe was the first broccoli rabe of the season (even if I know it was managed with the help of a ‘high tunnel’). Finally, sharp eyes will notice, from the evidence in the picture above, that [like my Mother] I don’t wear my ring while cooking. 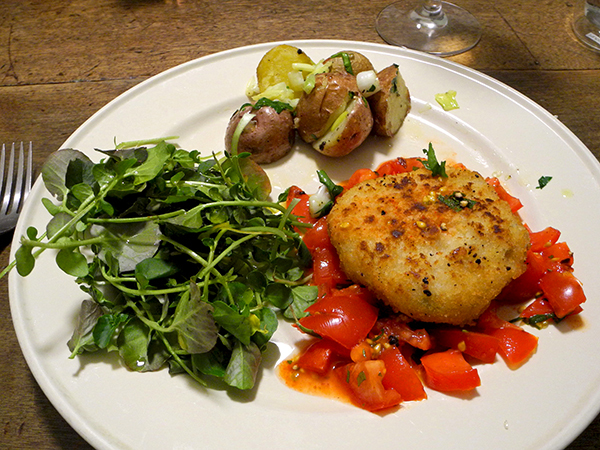 The potatoes were really sweet, mirabile dictu; the cress actually exciting, if you can also imagine that; and the salsa had a fairly complex zing [zip? ], probably because it included both a Basque paprika thing and some pepperoncino.